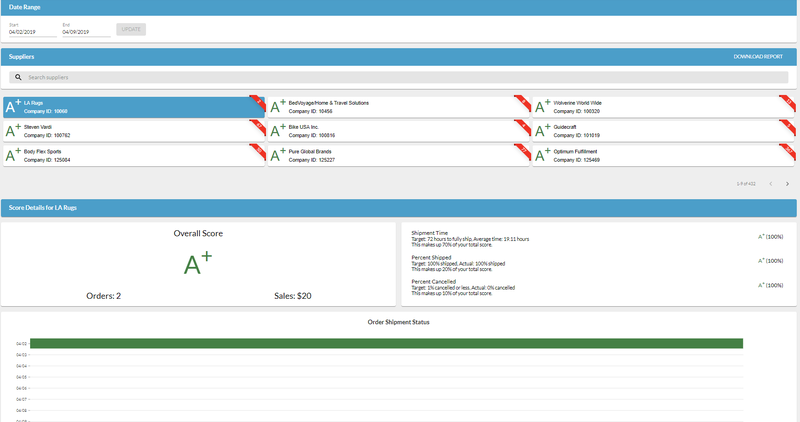 The retailer score card is used to provide you with a view of how well you are scoring with your retailers. The overall score will be based on a letter grade ranging from A+ to F, and will be weighed based on 3 parameters; see Score Details below for how it is calculated. Date Range: This section will be used to configure the scorecard report for all of your partners. By default, the report set to the past week, but it can be adjusted to any date and time to monitor your partner's grades. Once the Start and End dates are updated the scores and statistics will update for everyone. Retailers: This will provide an overall view of the grades for each retailer. It will also provide you the amount of orders received, given the time range, in the ribbon. The Company ID will be used to identify your partner; this will be the Sender/Receiver CompanyId when using the API. You can click on different retailers to see further Score Details underneath. Score Details: This section reports the score by the letter grade. The letter grade is determined by a weighting system of Shipment Time, Percent Shipped, and Percent Cancelled. 70% of the overall grade is determined by the shipment time, 20% by the percent shipped and 10% the percent cancelled. Shipment Time: This will be the average time it took to ship orders in the configured time range. By default the target will be 72 Hours, as long as shipping takes place within the 72 hour window, the system will report a passing grade. The longer past that period the quicker the grade will diminish. If no orders have been shipped then it assumes all open orders are being shipped that day and will populate the score accordingly. Once one order is shipped the scorecard data will be based on the shipments. Percent Shipped: This is calculated off of how many orders are in the system given the time range compared to how many are shipped, ignoring cancelled orders. The target % shipped is a dynamic number which will change according to how many orders need to be shipped within to meet the 72 hour shipment time target. Percent Cancelled: Shows how many orders were cancelled given the time range configured. By default the target is to keep cancellation to 1% or below the total of orders. Order Shipment Status: This section will provide a chart, given your configured time range and show how many orders were Shipped, Not Shipped and cancelled each day. This will help provide a more visual representation of your overall score. The supplier score card is used to provide a view of how well your suppliers are scoring. The overall score will be based on a letter grade A+ to F, and will be weighed based on 3 parameters; see Score Details below for how it is calculated. Date Range: This section will be used to configure the scorecard report for all of your partners. By default the report will be set with the past week, but you can adjust the date and time you want to monitor your partner's grades. Once you update the Start and End dates the scores and statistics will update for everyone. 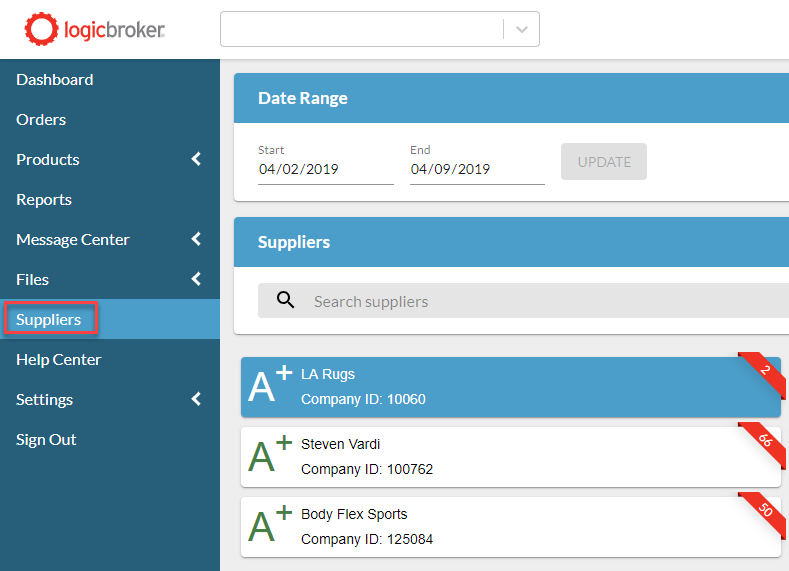 Suppliers: This will give you an overall view of all the supplier's grades. It will also provide you the amount of orders received, given the time range, in the ribbon. The Company ID will be used to identify your partner, this will be the Sender/Receiver CompanyId when using the API. Score Details: In this section you will see your score which is determined by the letter grade. The letter grade is determined by a weighting system of Shipment Time, Percent Shipped, and Percent Cancelled. 70% of the overall grade is determined by the shipment time, 20% by the percent shipped and 10% the percent cancelled. Shipment Time: This will be the average time it took for you to ship your orders in the configured time range. By default the target will be 72 Hours, as long as you are shipping within the 72 hour window, you will receive a passing grade. The longer past that period the quicker your grade will diminish. If you have no shipped orders then it assumes all open orders are being shipped that day and will populate your score accordingly. Once one order is shipped the scorecard data will be based on the shipments. Percent Cancelled: Shows you how many orders were cancelled given the time range configured. By default the target is to keep cancellation to 1% or below the total of orders.